Tele-technology in the health care system is prognosed to be able to produce better health, better care at lower cost (Triple aim). This paper will discuss the validity of this prognosis, which in many ways is considered as some sort of diagnosis of the conditions concerning triple aim in relation to Tele-technology. Tele-technology in the health care system covers three different types of technological settings: telecare, telehealth and telemedicine. 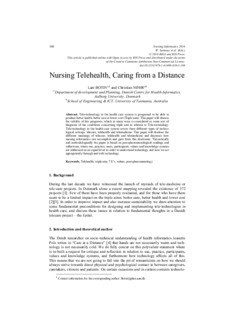 This paper will disclose the different meanings of telecare, telehealth and telemedicine and discusses how nursing informatics can accomplish and gain from this disclosure. Theoretically and methodologically the paper is based on post-phenomenological readings and reflections, where use, practice, users, participants, values and knowledge systems are addressed on an equal level in order to understand technology and how we act appropriately through and with technology.